You’re not alone. With so much uncertainty surrounding the global economy, more and more people are searching for options like a gold 401K to protect their retirement savings from further volatility. ➜ What is the difference between a gold IRA and a gold 401k? ➜ Why should I consider investing in a gold 401k? ➤ Many people saw their retirement accounts drop by hundreds of thousands of dollars in a short amount of time. ➤ Even so-called “low-risk” investments in stocks, mutual funds and bonds were hit hard when the economy tanked. ➤ To this day, many people who had planned to retire in the last decade are still working, trying to make up for lost ground during the recession. ➤ Because of the nature of the stock market, no one knows when the next big drop will come – but the bumpy global economy certainly isn’t easing people’s fears and anxiety. For these reasons and many others, many people are investing heavily in precious metals, such as gold, silver, platinum and palladium to protect their retirement accounts from further decline. If you’re thinking about a gold 401K, there are a few things you should know. Use the information below as a brief guide to understanding your options, and be sure to speak to an experienced precious metals specialist who can help you determine what’s best for your financial goals. It’s important to remember that many employers’ 401K plans have very limited investment options. If your plan doesn’t give you the option of investing in gold assets, then a “gold 401K” simply won’t be available to you. However, you still have other great options. A gold-backed IRA (Individual Retirement Account) is a great alternative to a 401K (an employer-sponsored plan), especially if you have a 401K with a previous employer, or you already retired from the company where your 401K was originated. You can easily convert your eligible 401K into an IRA that is backed by investments in gold or a mix of precious metals. Unlike an employer-sponsored retirement plan, which restricts your investment options, an IRA lets you diversify your savings however you choose. So, for example, if you wanted to keep all your investments in gold assets, or mix it up with other stocks and mutual funds, these choices are completely up to you or your precious metals advisor. Why Even Think About a Gold 401K? One of the most compelling reasons to convert your 401K into a precious metals IRA is to diversify your savings. Diversification is the key to protecting your investments from the volatility and decline of other markets. If you are investing entirely in paper assets, like mutual funds, stocks and bonds, then you are putting your retirement at risk. Gold and other precious metals can provide a safe haven for your retirement savings, protecting it from the volatility of other markets. It’s no secret that gold has experienced steady gains for decades and has soared to new highs over the last several years. Historically, the same economic instability that weakens stocks and other paper investments actually increases the value of gold. With no clear resolution to global economic problems in sight, and as finite gold resources become more scarce over time, many expect the price of gold to continue its climb well into the future. This is what makes a gold 401K or IRA such a smart option for retirement planning. You don’t want to worry that your life’s savings is going to be wiped out by economic factors that are completely beyond your control. Your retirement should enable you to live as you do now; and it shouldn’t be filled with stress and anxiety about what the economy or declining dollar will do to your worth. Gold tends to hold value above inflation and thus helps protect your purchasing power from the decline of the U.S. dollar. With a gold-backed IRA, you can have peace of mind knowing that your investments can help you preserve your lifestyle and achieve your retirement goals as planned. 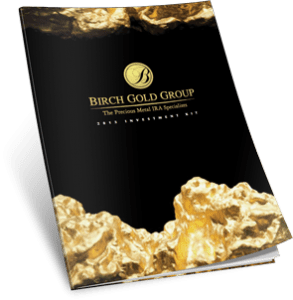 If you are ready to take the next step toward investing for your future, or you simply want to learn more about a precious metals IRA, Birch Gold Group can help. 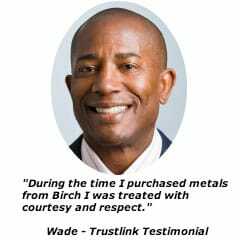 Rated A+ by the Better Business Bureau, Birch Gold Group is a leading precious metals company that specializes in gold-backed IRAs. Our knowledgeable precious metals specialists can help determine the right investments for your situation, and we are happy to educate you on all your options. If a gold 401K is not available through your employer, we will walk you through the simple process of converting your eligible 401K or IRA into a gold-backed IRA. If you are interested in additional options, we can also discuss the advantages of purchasing gold bullion or numismatic coins for personal possession. Our specialists will answer your questions and make sure you are completely confident in your decision to protect your retirement savings with investments in precious metals. Call us today at (800)355-2116 or fill out the form on this page to learn more.